At TaskMasters, we are trained in wood restoration and doing it properly. Our purpose is to provide quality workmanship in a professional manner and to help educate our customers on the log home restoration and cleaning process. We take the time to explain the options available and the procedures needed to achieve your cleaning maintenance and restoration needs. We do a detailed job analysis and will answer any questions to better help you understand any recommendations. Not only can we handle your log home restoration and cleaning needs, but we can save your deck or dock. We will evaluate the wood and explain what options are available. We will go through each process step by step so you can make an informed decision that best suits your needs. As a family operated business, we believe that integrity and attention to detail are imperative to our success. TaskMasters was founded to address the needs of Christiansburg homeowners and businesses alike that were unable to find competent, dependable and trustworthy service providers. We believe we have met those needs and will continue to strive for professional results in all aspects of our services. From log home restoration to deck and dock pressure washing, we will do our best to provide you with top quality, professional Christiansburg cleaning and restoration services. We are licensed, insured and certified contractors for Wolman, Flood and Penofin wood restoration products as well as qualified applicators for Perma-Chink Systems, a nationwide supplier of log home maintenance products. We use only contractor grade, environmentally friendly cleaning compounds, sealers and finishes as opposed to store bought bleaches and detergents. So you can have peace of mind knowing that our company will handle all your Christiansburg wood restoration and cleaning needs with the utmost quality and environmental care. Exterior house painting can make your Christiansburg home look great. You can change the color of your home, decks, shutters and trim to really make it "pop". On your next Christiansburg exterior painting project, call Taskmasters Wood Maintenance. We can take care of the entire painting process for you, from washing and priming to caulking and painting. TaskMasters is an independent mobile wood restoration and pressure cleaning contractor serving residential and commercial customers throughout North Carolina, South Carolina and Virginia. We specialize in log home and deck restoration, exterior pressure washing, asphalt, slate and shake roof cleaning, and storefront and awning cleaning. We also perform small maintenance repairs from log replacement and floor rot to shingle repair. We will schedule our restoration and cleaning services to accommodate your needs and to avoid business interruptions. Adhering to strict safety guidelines and regulations, we conform to all city, county and state ordinances and have all necessary OSHA approved safety equipment. Roof cleaning is becoming more and more popular especially in the Southeastern United States because of an airborne algae called “Gloeocapsa Magma”. It is identified by the black streaks and stains that are mainly found on the north facing side of the roof, but does spread to the entire roof eventually. In the beginning this algae is more of an eyesore than anything, and can be easily removed. Left on the roof, it will keep spreading until it covers the entire roof. At this point it becomes food for mildew and lichens and this is where the real trouble starts. Be careful! Many times a roofer will be called in to inspect the roof and some roofers will tell the homeowner that they need a new roof and in some cases, that may be so. But, too many times just a cleaning will suffice saving the homeowner thousands of dollars. Left unattended, however, Gloeocapsa Magma can cause severe damage to your roof. For a professional cleaning that will take care of this issue, contact TaskMasters today. 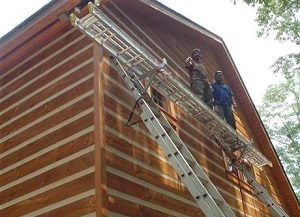 If you're looking for a professional log home restoration contractor in Christiansburg, then give us a call 252-266-9457 or complete our online request form.